The couple is related to the last home I built in Lake Mills and it’s actually right across the street! Nice! At the end of November, the site was excavated for the new home and the concrete foundation was poured in the first part of December. As soon as it was ready, we were setting floor trusses and laying the subfloor on December 12th. Since the weather was nice the next day and we were waiting on the panels for the exterior walls to be delivered, we did a little homework ahead of time – so to speak – and framed up the interior walls so we could quickly install them in case the weather took a turn for the worse. That Friday the panels arrived from Extreme Panel Technologies, Cottonwood, MN. 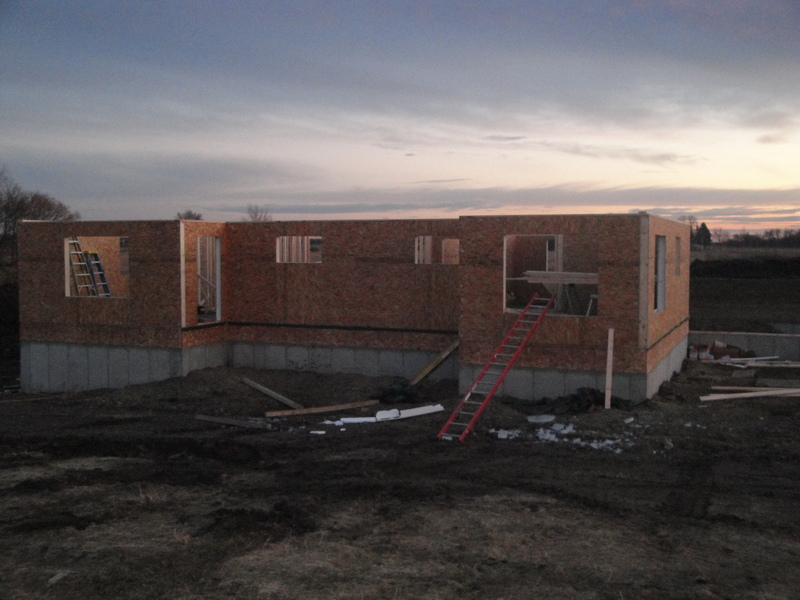 First thing Monday, Dec 19th, we were putting together the exterior walls. Tuesday we finished the exterior and moved on to installing those interior walls we had a jump-start on. Can you believe this is just 4 days of carpentry work? Crazy. This is one of the key reasons we have such positive views on Structurally Insulated Panel (SIP) construction. It saves a lot of time, and we all know time is money… and who doesn’t like to save a bunch of that? Another thing to notice in these pictures is the lack of construction waste. All the panels are custom, created just for this home plan. That means they are all pre-measured, the doors and windows openings are cut in, and we are able to have very little construction site waste during the early stages of rhe building process. Check out the one picture… it shows how the panels already have electrical chases for the wiring to be pulled through. I’m not going to go into the energy efficiency, which is amazing, but you can check out more info on the “Building with SIPs” tab above.